Wednesday, June 14th was our Low Energy Day and we are expecting great savings on heat, water and electricity in comparison with other days. Watch this space for updates. 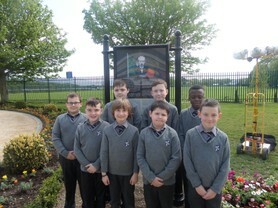 Ms. Ronan and the boys of the Green Schools Committee were invited to the opening of the new Thomas Clarke Memorial Garden opened last week in memory of the 1916 leader and signee of the Proclamation. Check out some of the pictures below. We have received the fantastic news that all our hard work this past year conserving energy, has paid off. We will receive our second green flag at a presentation in the Helix Theatre in DCU next month. Many thanks to all the pupils and staff for their efforts to reduce our energy consumption in the school. Our Green Schools Committee has worked very hard to lead our task. Mrs. Aisling Sheridan of Louth Co. Co. visited the school and questioned the committee members on how we had saved energy and money and what steps we took to make the savings. She was very happy and impressed with all our hard work and the results we achieved. Our teachers and 2 pupils will travel to DCU to collect our second Green Flag next week. 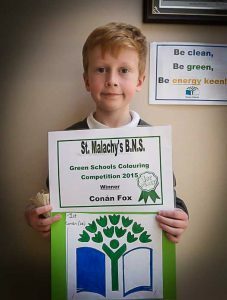 Welcome to St. Malachy’s B.N.S’ Green Schools page. 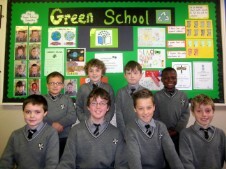 St. Malachy’s Green flag committee consists of both pupils and staff. It is co-ordinated by Ms Ronan. Mrs Hughes plays in an integral part in the implementation of our Green School’s programme also. 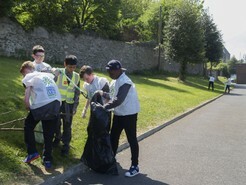 The committee work tirelessly to encourage and inform the rest of the school and the wider community about all aspects of the Green Schools programme in the Friary. We embarked on our first Green Flag for Litter & Waste back in 2012 under the guidance of Mr. Martin and MS. Rocks. After a two year programme the school was awarded their first Green Flag which flies proudly from the rooftop of our school building. In 2014 we began working on our second theme- Energy. An Energy Squad was established which is made up of 24 children from 2nd-6th. Along with the Green flag committee these children help make our aim of reducing energy possible. 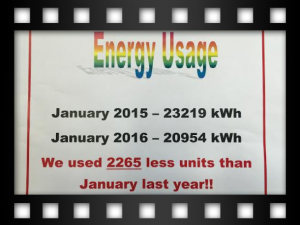 Not only do we wish to reduce the energy consumption here in school but we also hope that parents, families and friends will join us and try to reduce their own energy consumption at home. 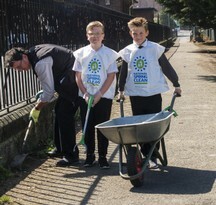 We are very appreciative of the support we receive on our Green Schools journey from the staff, pupils, parents, Board of Management, local media and the wider community. 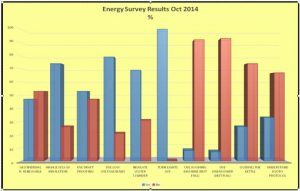 The Green Flag Committee and members of the Energy Squad carried out an Energy survey of our school in October 2014, April 2015 and October 2015. The surveys were carried out at lunchtime. In the table below we have compared our results from October 2014 with October 2015 (similar times of year). Overall, we can see that our Energy measures are having a great effect and our Energy Squad members are doing a great job. 1. We’ve managed to maintain a similar average classroom temperature even though we are using the heat for a shorter period each day. In October 2014, we were turning on the heat for a minimum of 4hrs each day (much more on a cold day). In 2015 the heating was turned on for an hour each morning. Our new heating system and insulation in the attic will have helped greatly. 2. More windows and doors are kept closed at lunchtime thus trapping heat. There is still room for improvement here though. 3. All classroom lights are turned off now. All were left on at lunch time last October. 4. There has been an almost 90% reduction in the amount of projectors being left on at lunchtime. (Still tiny room for improvement). 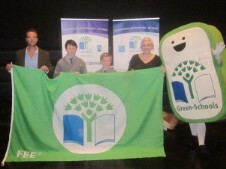 The presentation of our first Green Flag took place in Dublin on May 21st 2014. Mr. Martin, Ms. Rocks and two committee members attended the ceremony. For almost a year we have been busy with the quest for our first green flag. All classes have been involved and have participated enthusiastically. Mr. Martin, Ms. Rocks and the committee would like to acknowledge the support and co-operation of the children and staff. 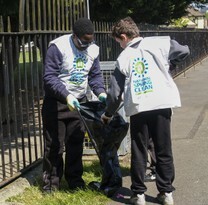 On 23rd April we took part in An Taisce Spring Clean. Over forty boys from 2nd – 6th class took part. The boys had a great time and did fantastic work. Teachers were overwhelmed at the effort everyone made. The children cleaned up all the litter in the driveway, the car park, and the school yards and the adjoining path. In addition, they also tidied up along the kerbs and swept up any leaves left lying around. All the hard work under the heat of the sun led to the children working up a thirst. Luckily, there were some lovely cool drinks awaiting everyone when the clean – up was over. The Green Flag Committee would like to express huge thanks to all the boys and staff in St. Malachy’s B.N.S. and Louth County Council for their continued support. 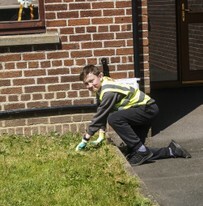 On 13th May the whole school took part in a Low Energy Action Day. Meter readings were taken in the days leading up the Action Day and on the day itself to compare how much we managed to save. 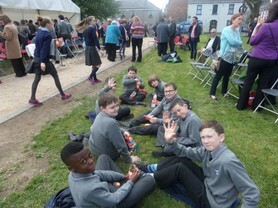 Children and staff made a huge effort in trying to cope for one day without using any unnecessary electrical equipment. We also turned off the heat earlier than we usually would. We used approx 400 less units than on a normal school day. What an achievement! Boys from 2nd – 6th took part in the school’s Anti – Litter Poster Competition after the Spring Clean. There were some really excellent entries and the judges had a tough decision to make. There was a prize for the winner from each class and one overall winner. The overall winner was Dennis from Mr Wynne’s 6th class. And we will be just fine!! We saved 244 units in one day! !